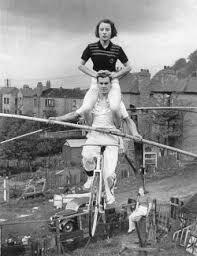 Bicycles have been specially adapted for all sorts of use since their inception, including high - wire circus and stunt riding. The tyres on a high wire bicycle are made of solid wood with a slot running around the circumference allowing the wire to be retained in the slot. The steering fork can be fixed solid since it is not used when performing on the high-wire. Stunt bicycles are made specifically for their purpose .Hence a bicycle used for jumps and being ridden on one wheel only will have strengthened wheels , large section tyres,fixed gear only and a seating/riding position that allows the rider to position the bicycle according to the stunts performed..